Spring has sprung! It’s time to get outside and explore all of God’s glory. The flowers are beginning to bloom, and the trees are starting to bud. The birds are chirping, and the bees are buzzing. It’s my favorite time of year to study nature. 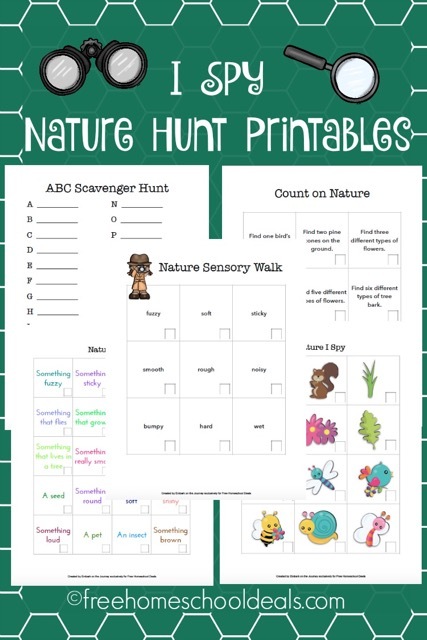 For that reason, I couldn’t wait to create some fun Nature I Spy printables to use with my own kiddo, and I just had to share them with you. This pack includes one scavenger hunt with pictures on it for your pre-readers. The others have a variety of items to hunt for. One encourages kids to use their senses. One encourages them to find something for each letter of the alphabet. The other two feature various nature items to hunt for. Print them out and laminate them for durability. Then, your little ones can can use them all season long.